Click the button below to add the Pacific AX Pedicure Spa to your wish list. The Pacific AX Pedicure Spa Chair is one of the most lush, cost-effective, chairs you could have in your salon or spa. The J & A Pacific AX is the perfect balance of affordability, functionality and quality. Customers ease in and out of the chair with the pivoting arm while the power recline and slide allows every client to perfectly position themselves to enjoy the Full Function Shiatsu Massage. The pedicure spa chair comes equipped with the Standard Pipeless Whirlpool Jet System but an optional Magnetic Pipeless Whirlpool Jet System is offered at an additional cost. A pivot up and down foot rest adds to the client experience while the dual function fill-and-spray hose helps makes the technician's tasks worry free. 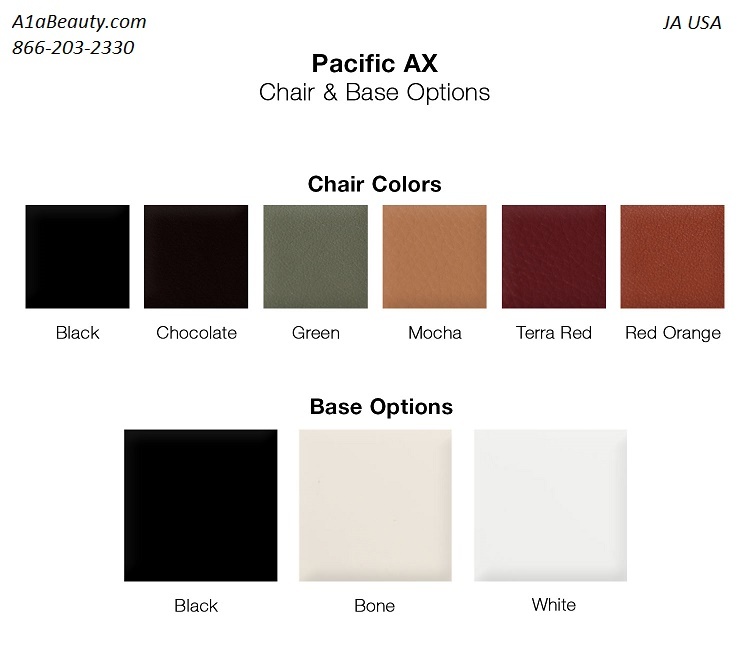 The Pacific AX is available in six striking chair colors plus three base colors.This is a custom item and all sales are final.